Plains Sioux Pictorial Beaded Hide Shirt. 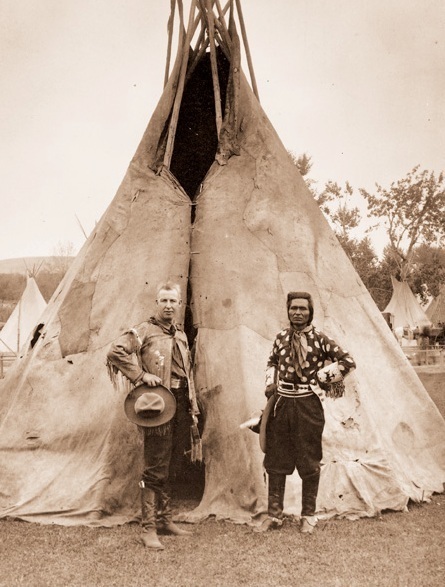 Photograph: This is Roy Bishop founder of Pendleton Woolen Mills and Jackson Sundown posing at the Pendleton Round-Up. The association of Pendleton Woolen Mills and the Round-Up goes back to the very beginning, when along with his brothers Clarence and Chauncey, Roy Bishop established the first mill at its current location in Pendleton, Oregon and helped launch the Pendleton Round-up Rodeo.